Sorry if this is a repeat thread, but I couldn't find the answer through search. On both mine and Mrs. ATL787's skymiles account, we are both showing $0 progress toward the Amex spend waiver, even though both of us are already $15k+ ytd. Anyone else having the same issue? When you logon to your Amex account using the Amex web site, does Amex tell you the number of DL redeemable Skymiles you currently have? Not a direct answer to your question, but an indication that the account linkages are at least working in one direction. I only have one data point, since I didn't spend on my card in January, but it seems the tracker didn't update until my Amex statement cut. Did all your spending occur in the current statement period? My tracker has updated approrpiately. Mine has been updating just fine. Did you have any returns or credits in 2018 for spend in 2017? This will count against your 2018 spend for MQD Waiver/MQM Boost. I'm assuming that your DL AmEx card is still linked to your DL FF account, but another check is whether RDMs post shortly after your closing date. Mine shows last updated date of January 30th. Prior to that, it was updating about weekly. Seems something might be up here. Mine shows as Feb 14th. I've noticed a similar issue. For January it was updating 2x a week but in February slowed down to being unpredictable. 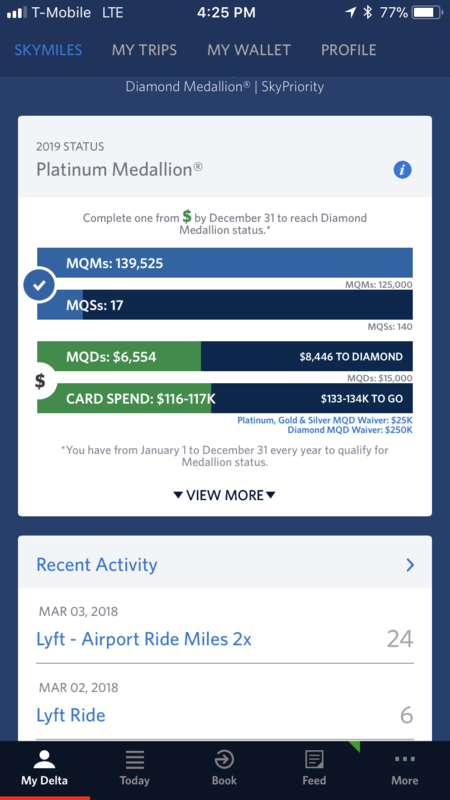 My spend in the Delta app hasn't updated since Feb 14th. Last year this happened as well. It eventually updated, but I have no idea why or how long it will take. My spend always seems to update a couple times a week. It is close to current right now. I’d call about this; sounds like something isn’t right. Hi everyone, wanted to let you know that we recognize that some Member’s MQD Waiver Card spend bar is not displaying accurate spend towards the waiver. Rest assured that all MQDs are still being accurately accounted for in our system and that this is a display issue only. We are working through a solution to fix the display as soon as possible. That's good news, but if we are crazy and trying to put $250K on the card, how can we track it in the meantime?!? Mine updates 1-2 times per week it seems. I spend about $10K per week. Um, on your online amex account? Not when you can't trust whether certain purchases qualify any longer.